If you read my August wrap-up post then you know that Lola and the Boy Next Door by Stephanie Perkins was my favorite read of August. It's coming out this month and I am so excited for its publication that I am hosting an international giveaway! 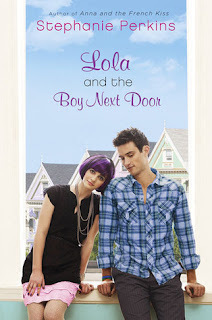 If you missed my review of Lola and the Boy Next Door, you can check it out here. You don't need to be a follower in order to enter, but I appreciate it tremendously and always give followers an extra entry. The deadline to enter is September 28th. Please refer to my giveaway rules. Also, I'll be shipping the book through Book Depository, so please make sure that Book Depository ships to your country. oh my gosh!! What an awesome contest, thanks so much! I am dying for this book--please enter me! And thanks for the giveaway! Thanks so much for including your international readers in this giveaway! SQUEEL! international giveaways are so rare and i live outside the US so having LOLA as a giveaway just made my day! thank you so much!!! Thank you so much for this fun giveaway! I keep waiting for my store to get LOLA in stock. We got LOLA early...in hb AND pb...why not LOLA! ?